3 layers of 100% cotton ruffles! Pretty white cotton ruffles! This gorgeous bedskirt has split corners so it's perfect to use with a canopy bed. Perfect for a shabby chic romantic cottage home! With a generous 18 inch drop this bedskirt is lovely! 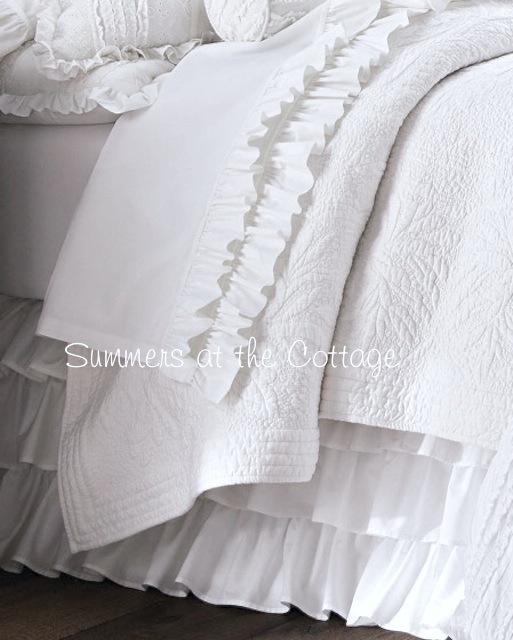 Brand new in package, this dust ruffle is for a Twin bed, and for those creative types, it could be altered and made in to a dreamy layered ruffled table cloth, pillow shams, cute clothes and more! Machine wash and dry.